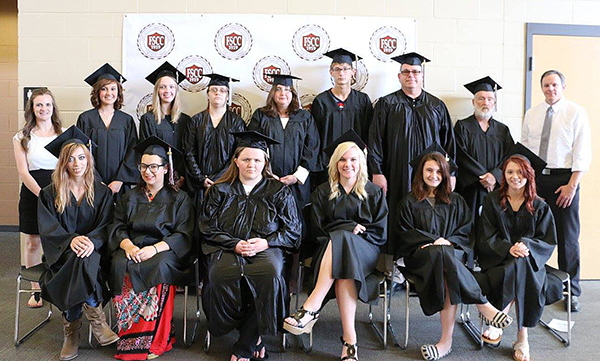 Fort Scott Community College offers adult education classes to assist students in GED preparation, basic math and reading skills, employment skills, and college preparation and transition. Individuals who have completed the adult education classes will have the opportunity to earn a GED, Basic Computer Skills certificate, and the Kansas Work Ready certificate. Adult education classes are open to students ages 16 and older. Students who are under 18 must have a Parental Waiver for Compulsory Attendance to attend class; the form can be obtained from the last school district the student attended. Attendance is mandatory all days of orientation. Class times are Monday through Thursday from 9 am - 12 pm, 1 - 4 pm, and 4 - 7 pm. The adult education center is located in the Student Success Center in Bailey Hall. Based on the results of your assessment during orientation, staff members will develop an individualized plan to help you achieve your goals. In order to be eligible to take the GED examination, you must have completed all of the adult education class requirements, passed all required exams, and have a valid government issued photo identification card. The cost for the class is $30 and includes the ACCUPLACER college entrance exam, Northstar Digital Literacy Certification, WorkKeys Employment Skills Test, TABE assessment, and one GED Ready Practice Test. GED testing fees are not included in the class fee.The GED test fees are $33 per subject (Math, Reasoning Through Language Arts, Science, Social Studies) which can be taken and paid for separately; due when you register for the test. Upon successful completion of the examination, the student will be issued a diploma by the Kansas State Department of Education. To enroll, please contact Aubrey Duft, Lead ABE Instructor, at 620-223-2700, ext. 4400.